What makes a super bloom? “It happens when all the weather conditions are just right, and that means substantial rainfall in late fall and early winter, cool daytime temperatures, and cold nights,” according to California nature guide and author Ann Marie Brown. For fire-following plants, once areas have burned during a wildfire, there are specialized plant species that respond to environmental cues, such as charred soil, smoke, and increased sunlight, and emerge from the soil in areas scorched by fire. These “fire followers” begin their growth cycle soon after the fire is out, especially once the rains come. The variety of wildflowers at Meher Mount became apparent during the native plant hike on Sunday, March 24, 2019, guided by botanist Rick Burgess of the Channel Islands chapter of the California Native Plant Society. I had been looking forward to this hike to learn more about native plants, specifically those growing on Meher Mount. I was armed with pad and pen and my husband Sam Ervin and daughter Stephanie Ervin were there to learn and to take photos. The group stopped, looked, photographed and discussed this “weed” in the walkway. Then someone else turned to another nearby plant to ask about it. It was 10 minutes before we were on our way to Baba’s Tree to view the flowering plants in the meadow. Then for the next three hours, the group examined the native plants at Avatar’s Point – including Baba’s Tree, a Coast Live Oak (Quercus agrifolia) – and later journeyed down the Well Road and along the back-access road stopping every few feet to examine and discuss the native species. Since, we had anticipated identifying maybe 15 to 20 native plants at most, I thought we could put together a straightforward, short list of plants. In fact, I was “worried” that the 20 people who came for the hike might be disappointed in the sameness and lack of variety. Was I mistaken! After two-and-a-half hours, my head was spinning with all the plants and flowers we were seeing. Because the oak woodland at Meher Mount is intact, Burgess noted that it is “such a great place” for seeing native plants. Hope of cataloging and photographing all the plants and flowers on this one hike became just a hope. A catalog is a project for a more trained naturalist or botanist. It’s still on the wish list to produce a guide that identifies the native plants and flowers at Meher Mount to help all visitors enjoy this abundance of plant life. On the hike, we also identified a few invasive species that need to be removed. To the untrained eye, many of the grass-type plants look similar. Members of the group freely shared their expertise, and Andrea Adams Morgan pointed out the difference between a native grass and the invasive Smilo Grass (Stipa miliacea var. miliacea). She works to identify invasives for some of the parks in the Carpinteria, CA, area, and Andrea urged us to remove Smilo Grass before it seeds and spreads. The Santa Barbara Botanic Garden posted on its website that Smilo Grass is a species that should be eradicated when encountered on private property near wildlands. The group also noted the non-native, invasive Italian Thistle (Carduus pycnocephalus). According to Cal-IPC, the Italian Thistle tends to grow taller and be a better fire ladder than native species. It also harbors insect pests, which attack native thistles. This thistle appeared in abundance in selected locations in Spring 2017 after the 2017 Thomas Fire. Volunteers have been monitoring and removing this plant for the past year at Meher Mount and will continue to do so this spring. “How to See California’s 2019 Super Bloom,” Visit California, accessed March 26, 2019. “Fire Followers,” Los Padres Forest Watch, accessed March 26, 2019. Plant Assessment: Stipa miliacea var. miliacea, California Invasive Plant Council, accessed March 26, 2019. Plant Assessment: Carduus pycnocephalus, Calfiornia Invasive Plant Council, accessed March 26, 2019. California Native Flowering Plants and Wildflowers, “A Guide to Flowers on Our Preserves,” Ojai Valley Land Conservancy. California Native Plant Society, Channel Island Chapter. 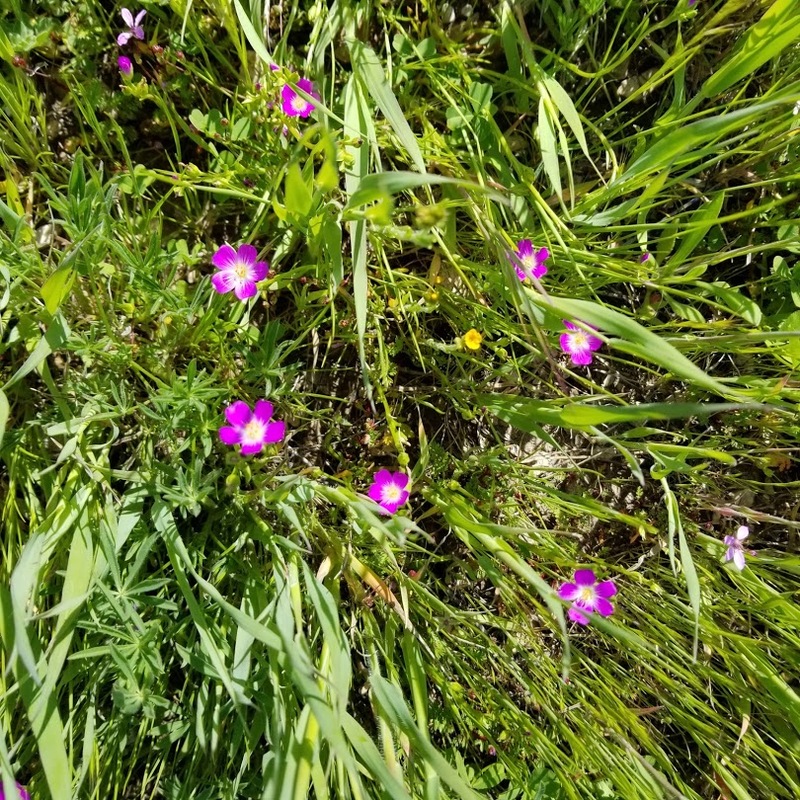 “Vascular Plants of Sulphur Mountain, Ventura County, California,” by David L. Magney, accessed March 26, 2019. ©2011 by David L. Magney. “Plants of Southern California: Fire Followers” by Tom Chester, updated August 11, 2018 and accessed March 27, 2019. ©2011-2018 by Tom Chester. What Is Being Grown? Are There Orchards?